The Badger State sits right between the Great Lakes Superior and Michigan, and these large bodies of self-contained freshwater occasionally affect its continental climate. Continental climates have warm, sometimes hot summers and very cold winters. Wisconsin receives approximately 187-190 days of sunshine annually (between sunny and partly sunny), which equates to a bit more than half its days. 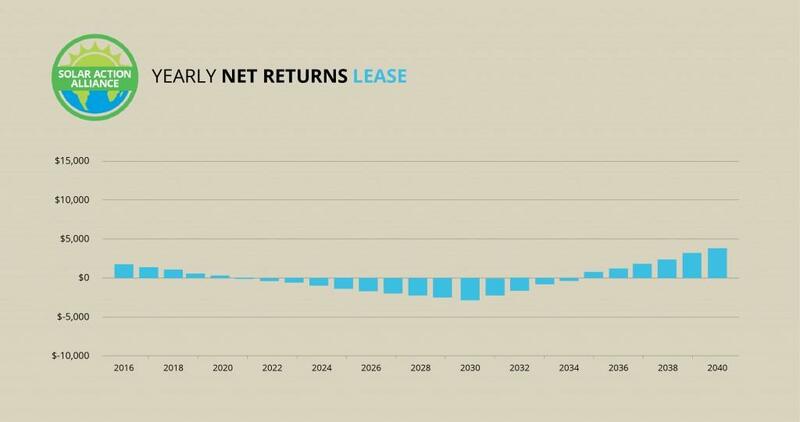 Wisconsin’s advocacy group, Renew Wisconsin, reports positive trends in the state that should last until the end of the decade, largely due to the Investment Tax Credit (ITC). The ITC is the 30% tax credit offered as a rebate for the acquisition of solar panel photovoltaic cells, or PV. Further, they specify that the United States Department of Agriculture (USDA) has enacted a Rural Energy for America Program that has $50 million in available grants for those who apply and are approved. Consumers have until February 1, 2016 to apply for up to 25% off the installation of PV cells. Fortunately, the cost of solar panel cells will be cheaper in coming years with or without grant deductions, according to Richard Swanson, formerly of SunPower, a manufacturer of PV cells. From firsthand experience, he deduced that the cost of cells has declined by half every decade for the past 40 years, culminating in a 95% decrease in cost over this time. 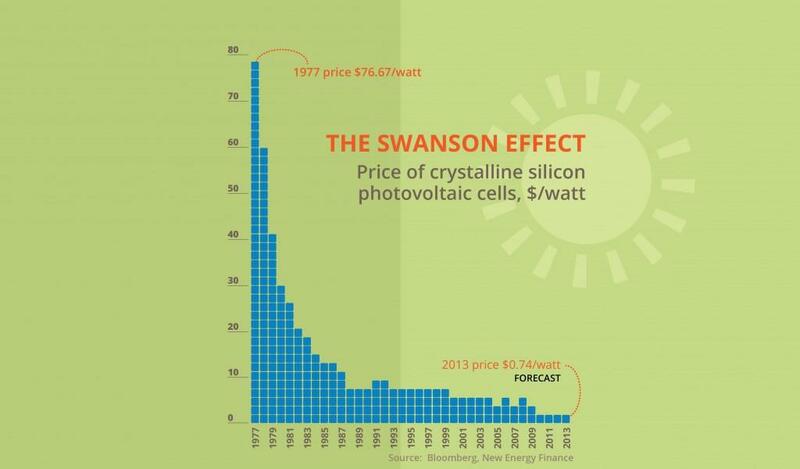 Observe the graph below for a visual representation of how cheap solar cells have become as seen in the graphic above. The cost of photovoltaic systems in Wisconsin is about normal, ranging from $17-18,000. Upfront costs for each method of acquisition will be reduced significantly by the federal tax credit in year one (or more, if you owe less than 30% of the cost in taxes). The following sections will cover the pros and cons of buying the system outright compared to buying it with a home equity line-of-credit. 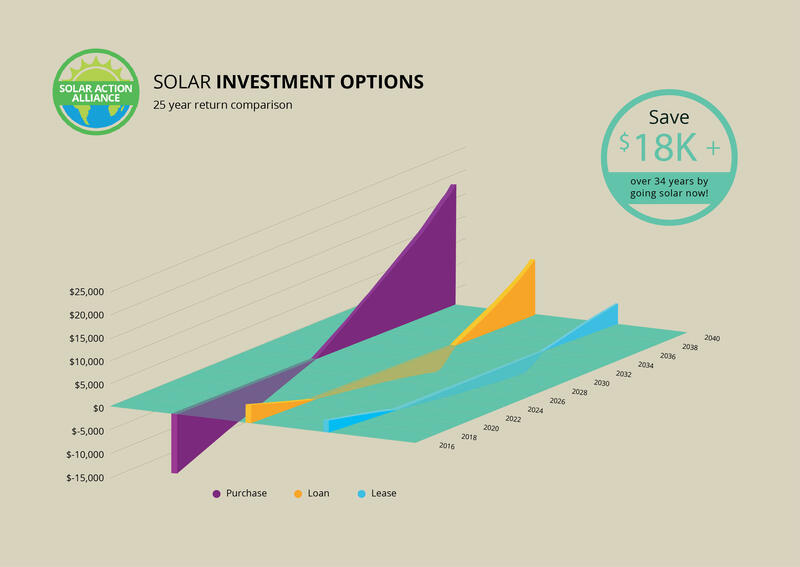 This chart shows the ROI for the expected life cycle of solar panels, which is about 25 years. 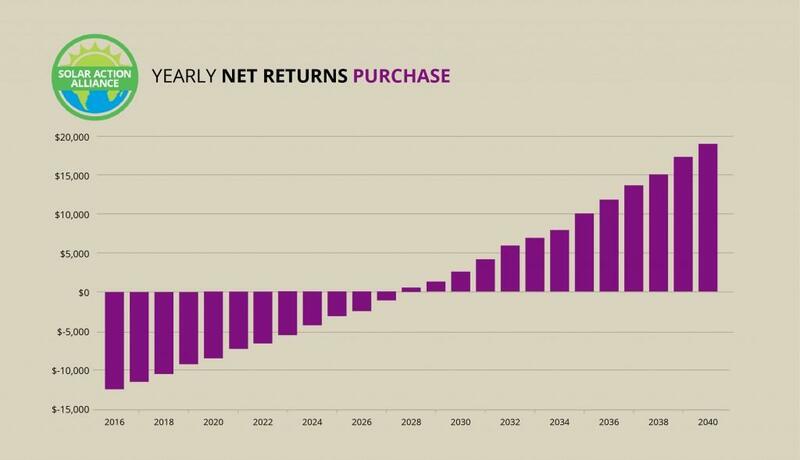 Purchasing in Wisconsin is a bit more feasible than most other states, with less upfront costs, and as you can see, the return is considerable. The HELOC option has a much smaller return, but it has the benefit of zero-down financing, an incremental payment plan, and a relatively low interest rate. There may be additional rebates for those who qualify for Energy for America grants, but since these are contingent on approval, they are not included in these calculations. Buying is the high-cost, high-reward option, reserved for those with at least $18,000 on hand, rounding up. Don’t be intimidated by this figure, though, as the 30% federal tax exemption will bring that number down considerably. For example, a system that costs $17,600 would see a tax credit of $4,560, making the initial cost a little over $13,000. Energy saving accrued in the first year should add up to another $800, making the initial investment a much more practical $12,200. Based on the expected increase in electricity costs, the savings should allow you to recoup the costs in 13 years, which is a few years shorter than most states. That leaves about 12 years of healthy returns, which can accumulate as much as $18,000 before the solar panel system’s life cycle ends. That should enough to buy a whole new system and keep a few thousand in your pocket! Assuming the loan is for the same amount as the cash purchase, expect the interest rate to add another $900 onto that price. Don’t worry, the federal rebate still applies to the original purchase price, which means $4,500 in tax credits can be put toward loan repayment. Loan payments will apply for the next 14 years, but these will be lowered by the energy savings throughout. After the loan is paid off, the savings become dividends that add up to over $11,000 or more, a solid return for a zero-down investment. For those without the capital or home equity to acquire a normal-sized solar panel installation, a smaller installation may be more applicable. A 2-kilowatt system will cost a much friendlier $7,400, and the 30% federal tax credit brings that number down to $5,180. The lower upfront cost may be lighter on the wallet, but the energy savings will be reduced by the same percentage. After the system has paid for itself in 15 years (or the loan is payed off), expect roughly $300-500 in savings for the duration, leaving you with a tidy sum of around $4,000 as a return on the small investment. 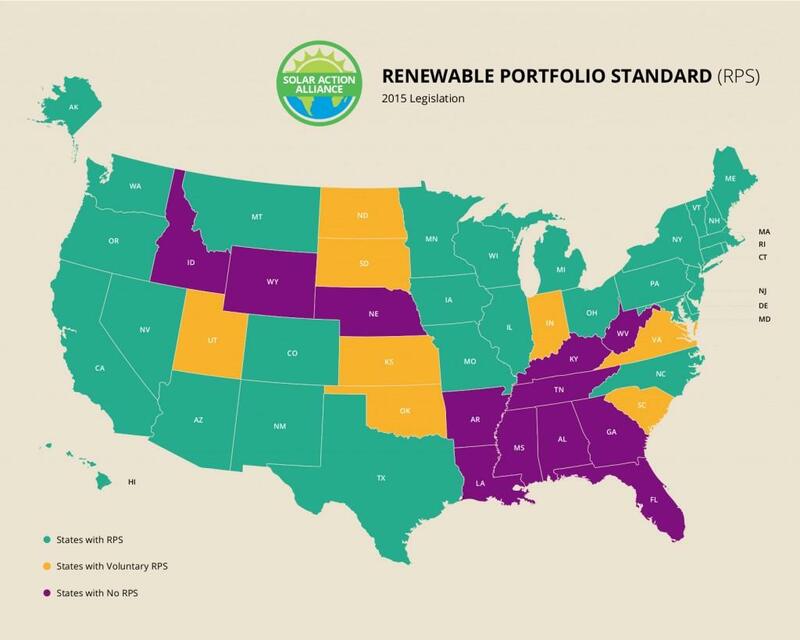 Wisconsin’s RPS was to have 10% of utilities come from renewable sources by 2015. That statement is past tense because the 10% quota has been fulfilled and expired. The percentage is quite low, and as it stands the state is without a current RPS. The good news is that it received support from state legislature and the 10% was met two years ago in 2013, showing that utility companies offered no resistance. Based on these facts, it is reasonable to conclude that a new RPS will be set in motion based on the same terms, though it would be better if the percentage was raised another 10%. Wisconsin utilities have a statewide energy and renewable resource program called Focus on Energy, which has galvanized local corporations to offer loans and incentives for renewable resources. 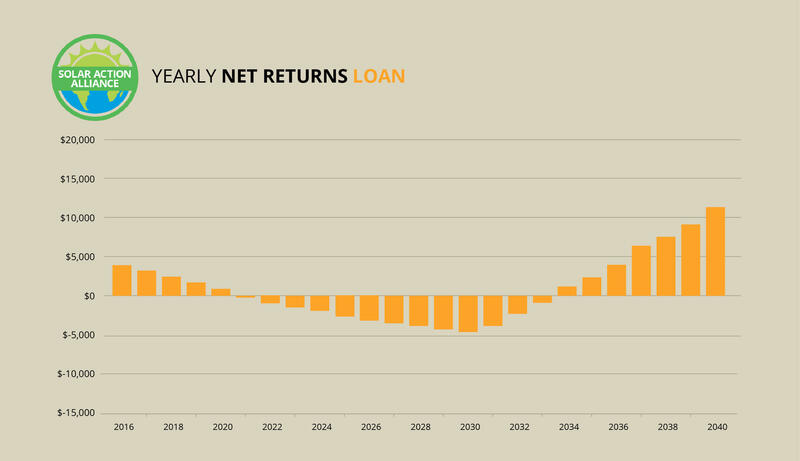 Their loan programs have put up a reported $2.5 million in low-interest loans, which are set to commence in 2016. The same revolving loan program will continue through 2017 and 2018. This strong non-government backing isn’t met entirely with the same enthusiasm by the local legislature, but the state does have a good amount of incentives in place. The state has property and state tax exemptions, a passable but expired RPS, and standard net metering and interconnection policies. 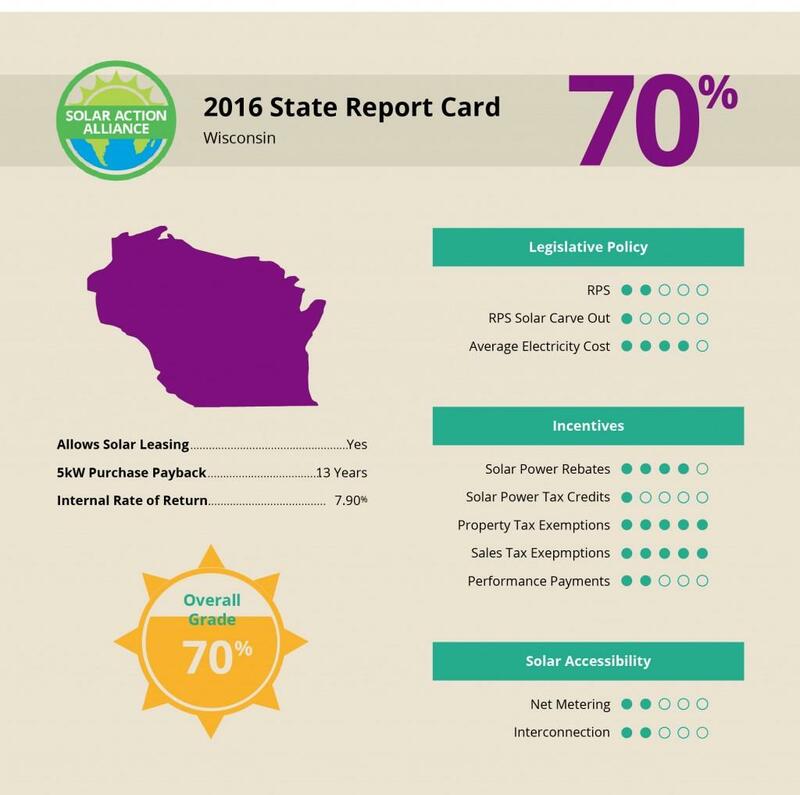 There is room for improvement among the state-supported aspects, but there’s reason to feel positive about the future of solar power in Wisconsin.